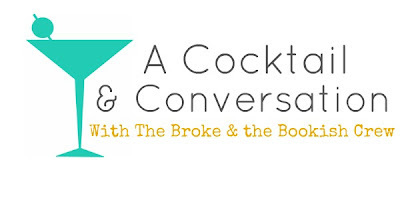 Every other Thursday here at the Broke & The Bookish is A Cocktail Conversation time. One of the TB&TB members will pose a question to 2-3 of the other members of TB&TB crew about books, life, music, etc and then they'll answer and we can converse about it. So grab a cocktail & cozy up for some conversation. It's 5 o'clock somewhere, friends. What distracts you easily when you’re reading? Bridget says: Background noise is a definite. I generally like there to be as little noise as possible when I'm reading. And something that stops me from reading on my iPad as often as I should is the siren song of other apps--it's so much harder for me to concentrate on a book when I'm reading on a screen, because my usual screen reading habits (ie general internet browsing) are a lot less attention-intensive than most books. Julia says:If I am on my tablet, wanting to go look something up that I just read about. Maybe it's fact checking, maybe it's just wanting more information before I continue. Recently I was reading the 4th book in the series and forgot what had happened in the third. I was so distracted by the fact that I should know what is going on! In general though I can zone pretty well into a book and only get distracted if someone starts talking to me. Tahleen says: It's terrible, but I get distracted by my phone or the Internet. I'll often find myself sucked into Facebook or Instagram or my email, and before I know it an hour has passed. I also get very distracted by the TV—anytime HGTV or the Food Network is turned on, there goes my evening. Lori says: I usually get distracted by the TV going in the background, even if it's not something I want to watch. I'll also get distracted by people's conversations, more so if I know the people talking. Like Julia, I am really bad about wanting to hop on my phone to fact check or read more about something I just read, which opens up a whole rabbit hole of distraction. What about you? What distracts you while you are reading? Great topic for discussion! For me it just depends on how well the book I'm reading grabs my attention- with a really good read, I block everything out, but if it's a book I'm struggling to get into then I'm more likely to have trouble ignoring the siren's call my cell phone, or the tv. I usually read right before sleeping when the house is quiet and there's just a little background noise, so reading where there's a lot of noise or if people are having conversations around me when I'm trying to read is really annoying! Also reading in daylight is slightly weird unless I'm on my bed. Scratch that, reading in any time or place that isn't my bed right before sleeping is strange for me. I guess I'm just a creature of habit. My cell phone. While I love having the entire of the Internet at my fingertips 24/7, I find that my iPhone has really put a crimp in my reading concentration. I've started trying to throw my phone in another room, giving it an opportunity to charge, while I read. I need to be better about it. I'm not sure why I feel the need to refresh Facebook 40 times within one page... it's an addiction that I need to break! Netflix. I got netflix in October and the lull of new shows that I want to watch tears me away frm ym reading. its atrocious. I need better will power. Also I only recently got internet browsing on my phone so usually i would read in the car (pointing out that I'm a minor who needs to be driven to school) so normally I would use my half our car journey each way to squeeze in some reading time but the call of the internet pulls me away! I get distracted very easily, I can't read when there are people talking in the same room, when there's a tv on and sometimes even when there's music on. I can read with some instrumental music on or in a busy room where so many people are talking that I can't actually hear what's anyone saying. I can read during a train journey, probably due to it mostly being either quiet or so busy I can't hear anyone specificaly. But I prefer total silence when I am reading. Hear that, lovethybook! I was just off for three days to watch my 15 month old and in a past life, three days off would mean HOURS AND HOURS AND HOURS of uninterrupted reading on my patio with a hot cup of coffee. With a 15 month old... NOOOOOOPE. And she is so energetic that when she finally DOES go down for a nap, all I only have the energy to flop on the couch and turn on Netflix for the next two hours. Ugh the heat! I live in Dubai, and it is so hot here right now that I have to jump up, get another glass of iced tea, and then once I am up and moving, I get distracted doing other things. Internet! I read on my laptop so there are times where I just minimize my nook for a bit and I forget all about it. Social media is definitely a distraction. For me, my family is a distraction. I can't find any alone time to read! agh!